If you like butterflies flitting about your yard, you should have a few Butterfly Bushes or Buddleia. These lovely shrubs bloom from mid-summer through August and attract many varieties of butterflies as well as hummingbirds. The flowers come in various shades of purple, pink or white and they grow to about 7 feet high. 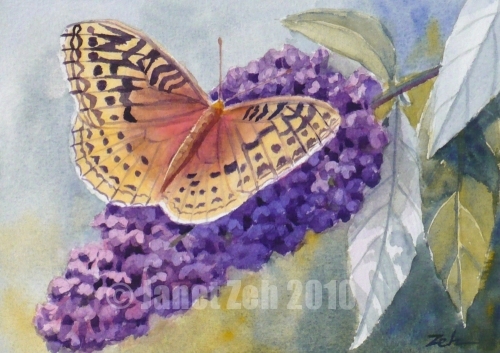 Here I've painted a butterfly visiting a deep purple buddleia in my garden. I like the cast shadows on the leaves giving the impression of soft, early morning sunlight. You can find my small watercolor paintings for sale in my Etsy shop, JanetZeh.Etsy.com. Thanks for stopping by today!